Valerie Bertinelli appeared on Oprah recently and attributed much of her weight loss success to diet and exercise using what she called her “miracle vest” or “walk vest”. Uni-Vest from IRONWEAR ™ is the only weight vest line to be endorsed by Reebok and sold by Reebok. It is used by more athletes and trainers around the world than all the other weight vests combined. The sleek patented compact design is the world’s best and most popular weighted vest. The basic long Uni-Vest™ is adjustable from 1 to 40 pounds. Individual ½ pound patented Soft Flex-Metal™ Weights (additional add-on weights sold separately) fit into unique stretch pockets which hold the weight securely on all sides. The soft rubber weights are evenly distributed over the vest and bend with your body. Supplied at 20 pounds, but is adjustable up to 40 pounds with the purchase of additional ½ pound Flex-Metal™ weights, sold separately. 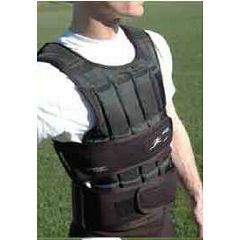 The oversized overlapping elastic strapping system holds the vest securely to almost any size torso while allowing for expansion and contraction of the chest during rigorous exercise. Has a heavy padded ballistic Nylon shell for maximum durability and soft fabric covered double stitched edges for comfort. The shoulder straps are strong and flexible to allow for a full range of motion. Comfortable. Strengthens. Easy To Use. Sturdy. Durable. Versatile. a little bulky at first . Strength Training. General Fitness. increase bone density. I'm using this with walking outside or using the treadmill inside to help increase slight bone loss and stay fit as I get older. Using it every other day for a weight bearing exercise. by Sheila from Pittsburgh, Pa. Comfortable. Strengthens. Easy To Use. Sturdy. Durable. Versatile. Reduces Stomach Fat. Performance Training. Weight Loss. Strength Training. General Fitness. Daily. strengthens Core. I use this product for walking, riding bike, treadmill workouts and working around home.I have lost several inches off my waist and my core is strong. Nothing else worked for me, like this product has. I bought one for my son first, who was a highschool basketball player at the time.His workouts are much harder than mine, but my workouts accomplish all of my objectives. by Middle aged but fit from West Palm Beach, Fl. Comfortable. Strengthens. Easy To Use. Sturdy. I like this vest alot. comfortable, fits well. not very bulky at all. I can wear it casually. good during exercise. Performance Training. Heart Rate Training. Weight Loss. Strength Training. General Fitness. Daily. Long-Term. Men. I can just wear it around the house or during exersise, it fits well and is comfortable. Comfortable. Strengthens. Easy To Use. Sturdy. Performance Training. Heart Rate Training. Weight Loss. Strength Training. General Fitness. Durable. Versatile. Easy To Use. Great for adding weight to workouts and for simulating body armor. Comfortable and durable. Is this vest waterproof and safe in a pool?